I designed this mount to hold a pair of DPS-1200FB power supplies to upgrade my Rostock max V2 for 24V heated bed easily. They (should) mount directly up to the stock bolt pattern using the same m4 screws if your unit has the non-ATX 12V 350W supply; I've placed m4 inserts in the same 50x150mm pattern. It sits entirely within the footprint of the existing power supply in my unit, and since it is a pair of 12V supplies I can tap off the 12V rail for most of the electronics and use them in series for a 24V rail to run the bed and hot end, etc. 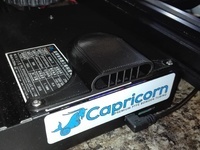 These power supplies are great ,reliable, small, and powerful units, rated for 900W (12V 75A) each when powered at 110VAC 60Hz or 1200W (12V 100A) when run from 220VAC. The supplies install using the latch mechanism just like they would in the server they're intended for, so they are easy to remove and replace if necessary. Just unplug wires, press the lever, and slide out. 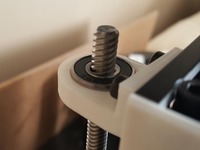 There is a slot for a large zip tie to hold the output ends more securely to the bracket if necessary. 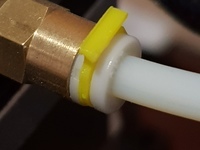 Needs 4 M4 4.7mm deep thermoplastic inserts from McMaster, which are installed downwards from the top to help prevent them pulling out of the part. The upper power supply in the series will require some modification to separate the output DC return from earth ground. The housing remains grounded so safety isn't compromised, but of course you perform these modifications and use this mount entirely at your own risk. That said, its very common to do this mod to use these supplies for RC plane/car/copter battery charging, so there are some good walkthroughs online. I've yet to hear of any issues with running them in series this way on the forums. 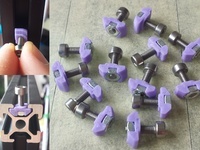 I've included clearance for the screw heads on the floating unit if they protrude at all (mine do). I haven't actually installed this yet, so I dont know for certain that it wont require some adjustment; I'll update the parts and descriptions if they do! I was originally going to use two of the single PSU cases, but then realized its a lot more efficient to make a dual mount that holds them by the ends. I've posted it anyway in case anyone finds it useful! UPDATE: edited the rear portion for the screw head relief cutouts. I was also thinking baout making this into a n actual rostock max side panel so the PSU fans vent the hot air directly to the outside. I could use an external Y cable to power both, and nonnect the power switch only to their enable/disable pin for turning the whole unit on and off. That would be cleaner and would probably free up some interior volume for the SSR and the current power panel could have a large fan in place of the current IEC inlet. 3 perimeters helps ensure the inserts have a good amount of material to bite into!